05 - Debbie Deb - When I Hear Music - Pandisc Music Corp.
06 - Freestyle - Don't Stop The Rock - Pandisc Music Corp.
Born Wes Pentz, Diplo was raised in the south and was influenced by the southern music scene, particularly Miami. As a DJ and producer, Diplo has worked with several artists in multiple genres, gaining their respect. The producer behind M.I.A. Diplo in his late teens he went back to Philly and New York, where he began to produce his own tracks. Diplo then released his diverse and funky 'Florida' LP in 2004. He has remixed for artist such as Beck and Gwen Stefani to Bun B, Kano and Le Tigre. Miami bass electro, hiphop, 80's and rock is a good way to describe Fabric live 24. 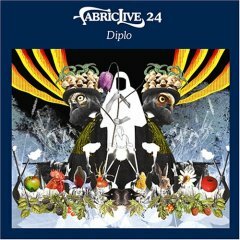 Those of us who can't get to London's Fabric club have the next best thing with Diplo's Fabriclive 24 On Fabriclive 24 he is joined by the likes of Big Boi, Ludacris, and Nina Sky. Musical styles on the album include modern dance tracks like Aphex Twin - Windowlicker , hip-hop, and rock. Fans will appreciate Diplo's ability to combine a variety of styles to create a unique club sound. The album also features remixes of tracks from the 80's like Cybotron - Clear and 90's and some hip hop tracks from today. Personally as good as a producer as Diplo he did'nt utilize his talent in this comp. He starts off great with Plantlife - Love 4 the World (Why They Gotta Hate?) but loses me at Cybotron. He goes through a few more eighties track and bass tracks that do not really flow in this set. Diplo regains my attention at windowlicker which is a great track, followed by This is sick which is also good. Featuring the orginal cut of the ludacris track is what ended any hope for me in this comp. All in all he tried to include every genre in the book and failed to make it flow creating a sub par mix compared to previous Fabric live releases.